After six days of Main Event action at the APL Road Series Vol.1 Philippines, local pro Lester Edoc overcame a powerhouse final table to capture the championship title and the Php1,478,700 (~US$28,300) first place prize money. For players in the Asian circuit, Lester Edoc is one of the most highly recognized players from the Philippines. Since his emergence into the live circuit in 2009, his portfolio has grown immensely, littered with achievements that includes a victory at the International Poker Open in 2015. Today, he claimed his second only major career title, outlasting other fellow pros – Mike Takayama and John Tech – at the final table. “I wasn’t getting any good cards which caused me to worry”. At the time, chip leaders Harold McDonald and BJ Perez were piling it in with both of them railing a couple of players while Edoc claimed just one head. All that changed at four-handed where he dominated the table. He began to ascend, winning numerous big pots to slide into the leader’s seat for the first time. He widened his lead after eliminating Perez to enter the three-handed bout in full command with over 70% of the chips in play. 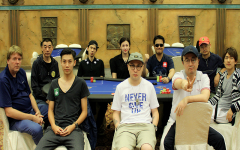 After putting away Guak Do Gyeong in 3rd place, he faced McDonald at the heads up round with 85% of the chips at his disposal. McDonald managed to hang on with a couple of double ups until Edoc delivered the finishing blow, reigning victorious with a full house over two pair. Winning the Main Event is a great accomplishment for Edoc who dedicates his performance to a special family member.Prior to entering the Main Event, he was driven by his father’s ongoing battle against an illness, inspiring him to persevere. You can read up on the Final 9 action in the live updates post linked below. We would also like to add one other shining moment by the champion. At Day 2, Edoc made one the most incredible calls of the tournament holding just ace-high to eliminate Jaeheung An who pushed his big stack with king-high. The Main Event ran a course of six days taking place from February 24 – March 1. There were a total of 276 entries driving the prize pool past the guarantee to Php6,693,000 (~US$128,400). 36 players were in the money with the top 9 places decided today.